Sadly, you’re not Tolstoy. And that’s okay! I know I’m sure as heck not Austen. But recognizing this allows us to pair our books with effective cover design that speaks to our book browsers, converting them into readers. 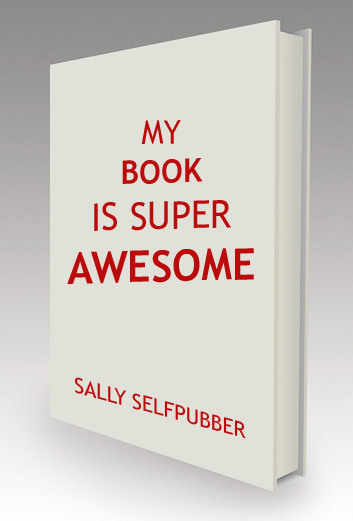 After all, would you pick up that book by Sally Selfpubber? I wouldn’t. Judging by that cover, she thinks she’s a mack daddy like Tolstoy who’s totally above compelling design. She’s not, and her sales will suffer for it. 2. 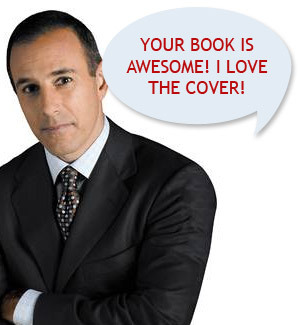 Your competition has compelling cover design. Go to Amazon and check out other books in your genre. Just the top 10 or so. Seriously, go ahead — I’m not going anywhere. What do you see? Are there common elements among the designs? 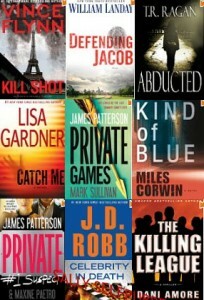 Look at the colors, the typefaces, the imagery and the general look and feel of the covers. The designers that worked on these books didn’t have a Spock-ish mind meld, causing them to choose similar design elements — they did what you just did. They checked out what works (hey, if a book is in the top 10 on Amazon, the author is doing pretty well) and emulated elements of it; improving where possible. Do you want to be stuck with a stock Createspace book cover showcasing rainbows and kittens while everyone else’s covers portray grisly crime scenes and moody skylines? Heck no! Your book deserves more! 3. Marketing results depend on effective book cover design. When you have a compelling book cover, it markets itself. Picture this: you’re sitting on the Today Show promoting your latest book (it could totally happen). In most cases, the book itself is somewhere close by. You’re either holding it, they show it while you’re talking or (if you’re really lucky), Matt is waving it around like it’s the greatest thing ever. Picture the cover of that book. I’m not going to pretend to know what it looks like, because it’s your book, but I’m going to guess it looks pretty awesome. I bet you’re darn proud of it. And, you know what? If you think it’s awesome, odds are your readers will too. They’ll want to learn more. Your book cover will be seen everywhere you go — in both online and offline marketing. It’ll haunt you at every book signing, interview stop, blog tour locale and bookstore for the entire life cycle of your book. This is why it’s so important to get it right! I don’t have any time. I have 5 kids and work 85 hours a week and my cat needs adrenaline injections 12 times a day and I have to go buy milk and the closest store is 100 miles away. I don’t have any money. Seriously, I ordered pizza last night and had to scrounge together change from couch cushions to pay the delivery guy. He totally judged me. And he drove a Pinto. DIY. There’s no sugar-coating it: DIY design, especially for authors without any design background, is seriously hard work that you have to do right. I know this sounds super cliche, but you only get one chance to make a first impression.If you’re going to go this route, my #1 piece of advice is this: take your time. Study other books in your genre, design in general, get feedback from readers as you go and drop your ego at the door. Not sure if you’re headed in the right direction? Drop us or the amazing Christine (one of our Indie Ninjas) a line. We’re willing to check out your cover and give you some tips. Go pro. Find a designer who fits your personality, timeline, aesthetic and budget. All that time you had to put in to go DIY (at the expense of your cat’s health)? Now you can use it to focus on everything else (editing, proofreading, marketing, watching TV, etc. ).The downside? It takes cold hard moolah, baby. Luckily for indie authors, there’s a whole industry popping up of design pros who are willing to do some pretty amazing work for a totally affordable price. Ahem…did I mention I’m one of those pros? No matter which route you choose to end up with that compelling book cover, just do it. Your book sales and marketing effort will thank you (your competition, however, will not). Do you have any questions about compelling design — how to achieve it, which route is best for you, how I know you’re not really Tolstoy? Drop me a line or ask away in the comments! Funny article, and true. (I love the, “You are not a special snowflake.”) However, as a graphic artist for an independent publisher, I say if you have no idea how to do graphic design, then DO NOT DIY. 99.9% of the time, your results will not turn out well and you will become frustrated. It is worth the cost of hiring someone or using a more professional service. Even then, be sure to compare to other well-selling books and NOT your “also-not-DIY-saavy” friends. They love you and will say they love your DIY when truthfully, it needs some work. Suzanne, I completely agree with your comment (and so glad you liked the “special snowflake” line)! Speaking as someone with a design background, I could not imagine trying to tackle a cover design without some experience behind me (talk about overwhelming), but the fact remains that many indie authors will choose, for one reason or another, to go that route. Your advice to them is 100% correct! Selfpub books have to be twice as awesome to compete with traditionally published books — it’s so important to make sure your cover measures up. Great article – a picture says a thousand words, so those thousand words best be good! Working on self-publishing at the mo & creating a brief for front cover illustration. Hard work but lots of fun! Thanks for the kudos, Sam! I think that phrase you used, “hard work but lots of fun,” describes self-publishing in general, huh? The possibilities really are endless — give us a shout if we can help out! Great advice. I too recommend that people get a professional cover for their books, especially novels. I must admit that I do my own covers – but my books have all been instructive non-fiction and the expectations seem to be different for academia than for novels. But, once I get the novel I’ve been working on for the past 185 years done you can bet I’ll sell a kidney if I have to to get a killer cover for it. I loved your article…So true. I have worked as a graphic designer for over 12 years and I know first hand how seriously clients they consider a piece of design that will portray themselves or their company. And designing a cover for your book should be no different. I don’t want to sound biased toward my own profession but having a professional design a book cover will reward you in te end when your book stands alongside those others books from publishing houses. Right on, Osvaldo. Indie authors aren’t just competing against other indie authors, but a slew of professionally-designed books from traditional publishing houses as well. A compelling cover may not make ALL the difference, but it certainly doesn’t hurt!